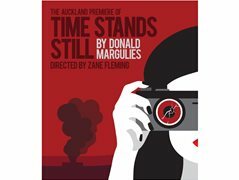 THE PLAY: Time Stands Still, focuses on Sarah and James, a photojournalist and a foreign correspondent trying to find happiness in a world that seems to have gone crazy. Theirs is a partnership based on telling the toughest stories, and together, making a difference. But when their own story takes a sudden turn, the adventurous couple confront the prospect of a more conventional life. Sarah: A photographer who returns to New York injured after spending years in Iraq covering the war. James: Sarah’s partner, a journalist determined to settle in New York after years in Iraq. Richard: an editor, best friend to Sarah and James (Sarah’s Ex). Mandy: an event planner, Richard’s (much younger) new girlfriend.